About 3 billion people live within 100 miles (160km) of the sea, a number that could double in the next decade as humans flock to coastal cities like gulls. The oceans produce $3 trillion of goods and services each year and untold value for the Earth’s ecology. Life could not exist without these vast water reserves--and, if anything, they are becoming even more important to humans than before. Mining is about to begin under the seabed in the high seas--the regions outside the exclusive economic zones administered by coastal and island nations, which stretch 200 nautical miles (370km) offshore. Nineteen exploratory licences have been issued. New summer shipping lanes are opening across the Arctic Ocean. The genetic resources of marine life promise a pharmaceutical bonanza: the number of patents has been rising at 12% a year. One study found that genetic material from the seas is a hundred times more likely to have anti-cancer properties than that from terrestrial life. But these developments are minor compared with vaster forces reshaping the Earth, both on land and at sea. It has long been clear that people are damaging the oceans--witness the melting of the Arctic ice in summer, the spread of oxygen-starved dead zones and the death of coral reefs. Now, the consequences of that damage are starting to be felt onshore. Thailand provides a vivid example. In the 1990s it cleared coastal mangrove swamps to set up shrimp farms. 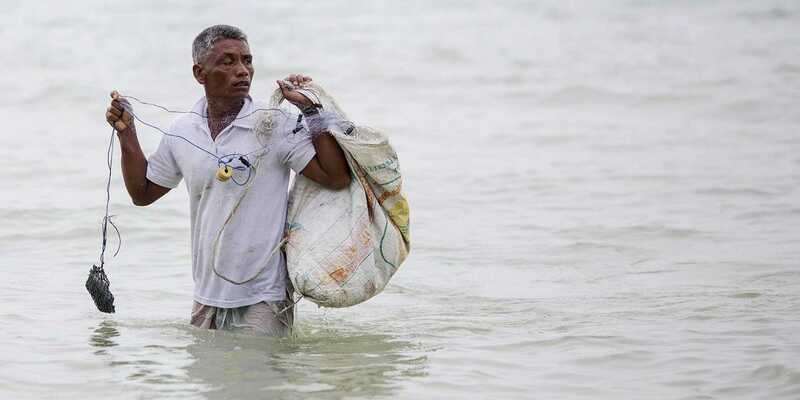 Ocean storm surges in 2011, no longer cushioned by the mangroves, rushed in to flood the country’s industrial heartland, causing billions of dollars of damage. 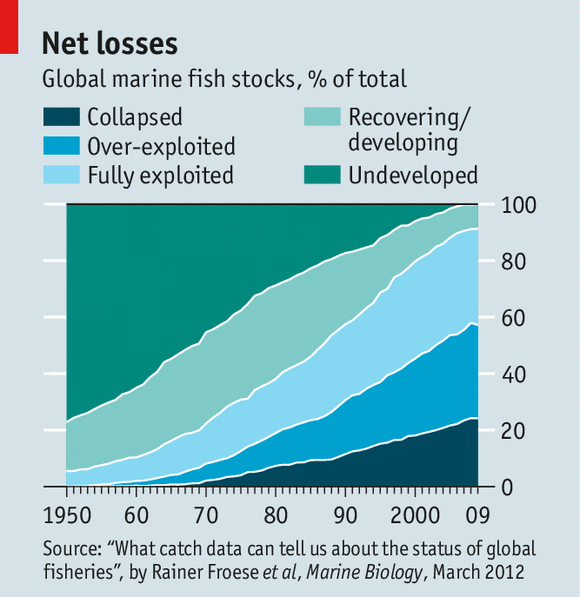 More serious is the global mismanagement of fish stocks. About 3 billion people get a fifth of their protein from fish, making it a more important protein source than beef. But a vicious cycle has developed as fi! sh stock s decline and fishermen race to grab what they can of the remainder. According to the Food and Agriculture Organisation (FAO), a third of fish stocks in the oceans are over-exploited; some estimates say the proportion is more than half (see chart). One study suggested that stocks of big predatory species--such as tuna, swordfish and marlin--may have fallen by as much as 90% since the 1950s. People could be eating much better, were fishing stocks properly managed. Climate change may be the reason. At the moment, the oceans are moderating the impact of global warming--though that may not last (see box on page 54). Warm water rises, so an increase in sea temperatures tends to separate cold and warm water into more distinct layers, with shallower mixed layers in between. That seems to lower the quantity of nutrients available for aquatic algae, and to lead to decreased chlorophyll concentrations. Changes in the oceans, therefore, may mean less oxygen will be produced. This cannot be good news, though scientists are still debating the likely consequences. The world is not about to suffocate. But the result could be lower oxygen concentrations in the oceans and changes to the climate because the counterpart of less oxygen is more carbon--adding to the build-up of greenhouse gases. In short, the decades of damage wreaked on the oceans are no! w damagi ng the terrestrial environment. The oceans exemplify the "tragedy of the commons"--the depletion of commonly held property by individual users, who harm their own long-term interests as a result. For decades scientists warned that the European Union’s fishing quotas were too high, and for decades fishing lobbyists persuaded politicians to ignore them. Now what everyone knew would happen has happened: three-quarters of the fish stocks in European waters are over-exploited and some are close to collapse. The salient feature of such a tragedy is that the full cost of damaging the system is not borne by those doing the damage. This is most obvious in fishing, but goes further. Invasive species of many kinds are moved around the world by human activity--and do an estimated $100 billion of damage to oceans each year. Farmers dump excess fertiliser into rivers, which finds its way to the sea; there cyanobacteria (blue-green algae) feed on the nutrients, proliferate madly and reduce oxygen levels, asphyxiating all sea creatures. In 2008, there were over 400 "dead zones" in the oceans. Polluters pump out carbon dioxide, which dissolves in seawater, producing carbonic acid. That in turn has increased ocean acidity by over a quarter since the start of the Industrial Revolution. In 2012, scientists found pteropods (a kind of sea snail) in the Southern Ocean with partially dissolved shells. It is sometimes possible to preserve commons by assigning private property rights over them, thus giving users a bigger stake in their long-term health. That is being tried in coastal and island nations’ exclusive economic zones. But it does not apply on the high seas. Under international law, fishing there is open to all and minerals count as "the common heritage of mankind". Here, a mishmash of international rules and institutions determines the condition of the watery commons. The high seas are not ungoverned. Almost every country has ratified the UN Convention on the Law of the Sea (UNCLOS), which, in the words of Tommy Koh, president of UNCLOS in the 1980s, is "a constitution for the oceans". It sets rules for everything from military activities and territorial disputes (like those in the South China Sea) to shipping, deep-sea mining and fishing. Although it came into force only in 1994, it embodies centuries-old customary laws, including the freedom of the seas, which says the high seas are open to all. UNCLOS took decades to negotiate and is sacrosanct. Even America, which refuses to sign it, abides by its provisions. 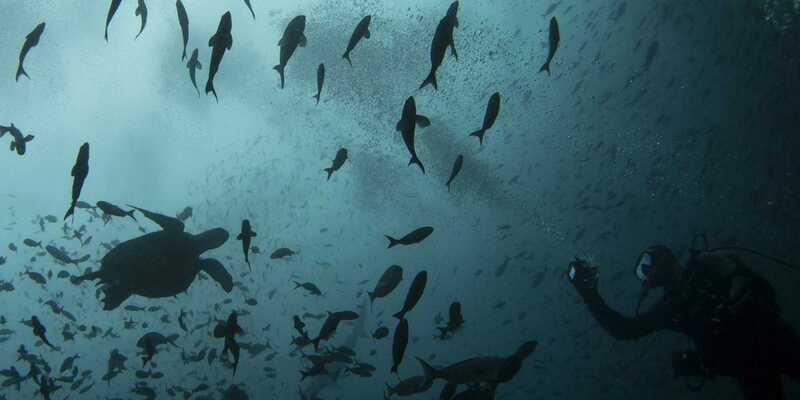 Specialised bodies have been set up to oversee a few parts of the treaty, such as the International Seabed Authority, which regulates mining beneath the high seas. But for the most part UNCLOS relies on member countries and existing organisations for monitoring and enforcement. The result is a baffling tangle of overlapping authorities (see diagram) that is described by the Global Ocean Commission, a new high-level lobby group, as a "co-ordinated catastrophe". Individually, some of the institutions work well enough. The International Maritime Organisation, which regulates global shipping, keeps a register of merchant and passenger vessels, which must carry identification numbers. The result is a reasonably law-abiding global industry. It is also responsible for one of the rare success stories of recent decades, the standards applying to routine and accidental discharges of p! ollution from ships. But even it is flawed. The Institute for Advanced Sustainability Studies, a German think-tank, rates it as the least transparent international organisation. And it is dominated by insiders: contributions, and therefore influence, are weighted by tonnage. Other institutions look good on paper but are untested. This is the case with the seabed authority, which has drawn up a global regime for deep-sea mining that is more up-to-date than most national mining codes. For once, therefore, countries have settled the rules before an activity gets under way, rather than trying to catch up when the damage starts, as happened with fishing. The problem here is political rather than regulatory: how should mining revenues be distributed? Deep-sea minerals are supposed to be "the common heritage of mankind". Does that mean everyone is entitled to a part? And how to share it out? Here, too, there have been successes. Stocks of north-east Arctic cod are now the highest of any cod species and the highest they have been since 1945--even though the permitted catch is also at record levels. This proves it is possible to have healthy stocks and a healthy fishing industry. But it is a bilateral, not an international, achievement: only Norway and Russia capture these fish and they jointly follow scientists’ advice about how! much to take. There has also been some progress in controlling the sort of fishing gear that does the most damage. In 1991 the UN banned drift nets longer than 2.5km (these are nets that hang down from the surface; some were 50km long). A series of national and regional restrictions in the 2000s placed limits on "bottom trawling" (hoovering up everything on the seabed)--which most people at the time thought unachievable. But the overall record is disastrous. Two-thirds of fish stocks on the high seas are over-exploited--twice as much as in parts of oceans under national jurisdiction. Illegal and unreported fishing is worth $10 billion-24 billion a year--about a quarter of the total catch. According to the World Bank, the mismanagement of fisheries costs $50 billion or more a year, meaning that the fishing industry would reap at least that much in efficiency gains if it were properly managed. Most regional fishery bodies have too little money to combat illegal fishermen. They do not know how many vessels are in their waters because there is no global register of fishing boats. Their rules only bind their members; outsiders can break them with impunity. An expert review of ICCAT, the tuna commission, ordered by the organisation itself concluded that it was "an international disgrace". A survey by the FAO found that over half the countries reporting on surveillance and enforcement on the high seas said they could not control vessels sailing under their flags. Even if they wanted to, then, it is not clear that regional fishery bodies or individual countries could make much difference. But it is far from clear that many really want to. Almost all are dominated by fishing interests. The exceptions are the organisation for Antarctica, where scientific researchers are influential, and the International Whaling Commission! , which admitted environmentalists early on. Not by coincidence, these are the two that have taken conservation most seriously. Countries could do more to stop vessels suspected of illegal fishing from docking in their harbours--but they don’t. The FAO’s attempt to set up a voluntary register of high-seas fishing boats has been becalmed for years. 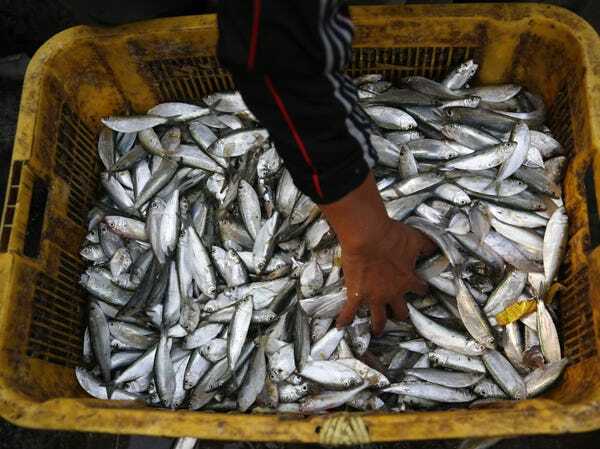 The UN has a fish-stocks agreement that imposes stricter demands than regional fishery bodies. It requires signatories to impose tough sanctions on ships that break the rules. But only 80 countries have ratified it, compared with the 165 parties to UNCLOS. One study found that 28 nations, which together account for 40% of the world’s catch, are failing to meet most of the requirements of an FAO code of conduct which they have signed up to. It is not merely that particular institutions are weak. The system itself is dysfunctional. There are organisations for fishing, mining and shipping, but none for the oceans as a whole. Regional seas organisations, whose main responsibility is to cut pollution, generally do not cover the same areas as regional fishery bodies, and the two rarely work well together. (In the north-east Atlantic, the one case where the boundaries coincide, they have done a lot.) Dozens of organisations play some role in the oceans (including 16 in the UN alone) but the outfit that is supposed to co-ordinate them, called UN-Oceans, is an ad-hoc body without oversight authority. There are no proper arrangements for monitoring, assessing or reporting on how the various organisations are doing--and no one to tell them if they are failing. Pressure for change is finally building up. According to David Miliband, a former British foreign secretary who is now co-chairman of the Global Ocean Commission, the current mess is a "terrible betrayal" of current and future generations. "We need a new approach to the economics and governance of the high seas," he says. That could take different forms. ! Environm entalists want a moratorium on overfished stocks, which on the high seas would mean most of them. They also want regional bodies to demand impact assessments before issuing fishing licences. The UN Development Programme says rich countries should switch some of the staggering $35 billion a year they spend subsidising fishing on the high seas (through things like cheap fuel and vessel-buy-back programmes) to creating marine reserves--protected areas like national parks. Others focus on institutional reform. The European Union and 77 developing countries want an "implementing agreement" to strengthen the environmental and conservation provisions of UNCLOS. They had hoped to start what will doubtless be lengthy negotiations at a UN conference in Rio de Janeiro in 2012. But opposition from Russia and America forced a postponement; talks are now supposed to start by August 2015. Still others say that efforts should be concentrated on improving the regional bodies, by giving them more money, greater enforcement powers and mandates that include the overall health of their bits of the ocean. The German Advisory Council on Global Change, a think-tank set up by the government, argues for an entirely new UN body, a World Oceans Organisation, which it hopes would increase awareness of ocean mismanagement among governments, and simplify and streamline the current organisational tangle. According to Elinor Ostrom, who won the Nobel prize for economics in 2009, to avoid a tragedy of the commons requires giving everyone entitled to use them a say in running them; setting clear boundaries to keep out those who are not entitled; appointing monitors who are trusted by users; and having straightforward mechanisms to resolve conflicts. At the moment, the governance of the high seas meets none of those criteria. Changes to high-seas man! agement would still do nothing for two of the worst problems, both caused on land: acidification and pollution. But they are the best and perhaps only hope of improving the condition of half of the Earth’s surface.